The activities are organized in six work packages to achieve specific objectives. WP 1 – MANAGEMENT COSTS: To assure quality, effectiveness and efficiency of the project. WP2 – INFORMATION AND PUBLICITY: To promote and disseminate the project and its results. It includes: Project graphics; Project social web community development and communication; Printing and dissemination of promotional materials; Final International events (1 in Patras, 1 in Lecce); Final project’s publication. WP3 – CC MSMEs’ CROSS-BORDER INCUBATION DEMAND AND OFFER ANALYSIS, ENGAGEMENT AND INTEGRATED DELIVERY: To develop the customized incubation program to be delivered. 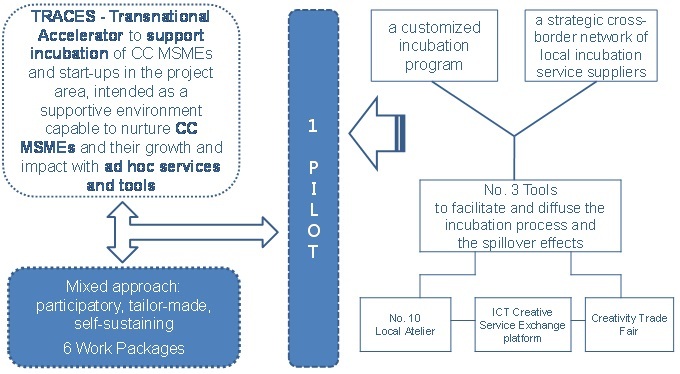 It includes: Mapping CC MSMEs potential in the project area; Awareness-raising and participatory assessment of incubation needs; Identification of the incubation services needed and related suppliers in the project area; Engaging incubation suppliers and setting up service delivery agreements including alternative finance and sharing economy; Finalizing the customized incubation program to be delivered. To develop a smart delivery environment to support incubation of creative entrepreneurship and diffused spillover effects. It includes: International benchmarking of creative incubation models; Identification, setup and training of No. 10 Local Atelier (5 in Apulia; 5 in Greece) capitalizing the Urban Lab model, for co-working services and gate keeping to incubation service networks; Design, development and implementation of the ICT Creative Service Exchange platform, where creatives can share services and obtain quotation and visibility of their businesses; Planning the Creativity Trade Fair as a biennial event where creatives, entrepreneurs from other sectors, professionals, investors, policy makers will be engaged in a creative networking business trip across Apulia and Greece; Setting the cross-border accelerator organization and user-guide. WP5 – TRACES PILOT IMPLEMENTATION. To pilot and follow-up TRACES for CC MSMEs in the project area. It includes: Animating TRACES among CC MSMEs; Creative contests to select 50 creative ideas or business projects (5 for each Local Atelier in Apulia and in Western Greece); TRACES delivery for ideas and projects selected; 1st Ed. Cross- border Creativity Trade Fair; Pilot assessment and drawing up guide-lines for the project follow-up. WP6 – ACTIVITIES OUTSIDE OF ELIGIBLE AREA. To knowledge transfer, exchange and disseminate at national and international level. It includes partners attendance at: International Workshop during ENCATC Annual Congress; Workshops in Athens and Rome.